Best known for his Ocean Park #83 paintings to which Green is related, California artist Richard Diebenkorn (1922-1993) began making prints at Crown Point Press in 1963, a year after its founding, and worked there almost annually from 1977 until his death. Whether engaged in a purely abstract mode, a figurative mode, or with favored motifs such as clubs and spades, revision was integral to Diebenkorn's creative process. 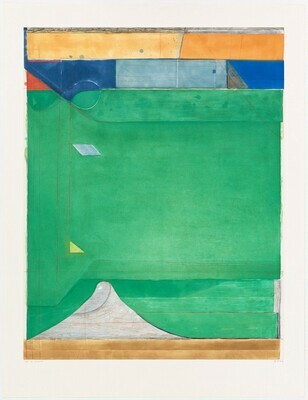 Green is widely considered to be Diebenkorn's greatest print and was a highlight of the Yes, No, Maybe: Artists Working at Crown Point Press exhibition, presented at the National Gallery in 2013. The print came into the collection in 1996, and now three outstanding preliminary impressions, known as proofs, of Green have been added. The earliest proof of Green has so much gray wash, it is arguably more watercolor than print; and the last has so many pasted-on elements, it is arguably more collage than print. After roughing out a composition and printing it in black, Diebenkorn would work back in—"attacking," he said, select passages and revising through gradual, often numerous, changes. These modifications would typically occur in the print's periphery. Although seemingly minor, their cumulative effect could be transformative. A mark resembling an infinity sign in the upper left of the first proof is camouflaged in the last one. And a curve in the lower left of the first proof gradually morphs into what looks like the upturned tail of a cat. In the final print, that tail is absorbed into a volcano-shaped mound. 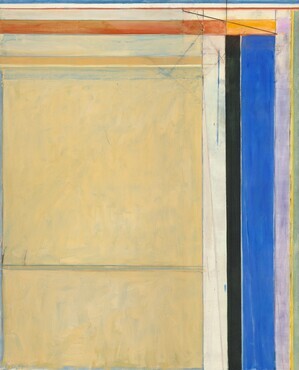 Diebenkorn was alert to how each change in a composition, no matter how minor, could alter its dynamics. He set his artistic course to an elusive "rightness," a term he regularly invoked and navigated by following an intuitive sense of what worked, reassessing and adjusting as he went along. In conjunction with the purchase of the three proof impressions of Green, Kathan Brown (American, born 1935), founder of Crown Point Press (null), has donated three more related proofs, each one unique, plus an additional fifty-seven works, from 1972 to 2010, by twenty-four Crown Point artists, including Chuck Close (American, born 1940), Sol LeWitt (American, 1928 - 2007), Julie Mehretu (American, born Ethiopia, 1970), Chris Ofili (British, born 1968), Kiki Smith (American, born 1954), Wayne Thiebaud (American, born 1920), and Fred Wilson. Thirty-five Years at Crown Point Press, National Gallery of Art, Washington, 1997, no. 8*. Three Centuries of American Prints: from the National Gallery of Art, National Gallery of Art, Washington; National Gallery in Prague, Prague 1; Antiguo Colegio de San Ildefonso, Mexico City; Dallas Museum of Art, Dallas, 2016 - 2017, no. 137. Thirty-five Years at Crown Point Press. Exh. cat. National Gallery of Art, Washington; The Fine Arts Museums of San Francisco, 1997-1998: no. 8*. Brodie, Judith, and Adam Greenhalgh. Yes, No, Maybe: Artists Working at Crown Point Press. Washington, DC: National Gallery of Art, 2013, p. 69, pl. 6.4. Brodie, Judith. "Gifts and Acquisitions: Richard Diebenkorn, Green." National Gallery of Art Bulletin 52 (Spring 2015): 28-29, repro.